The Skinny: A young would-be warrior quests to retrieve his clan's precious sword in this hilarious rock n' roll samurai comedy from inventive director Hiroyuki Nakano. With its fun visuals, killer soundtrack and charming cast, Samurai Fiction takes those old jidai-geki and chambara films immortalized by Akira Kurosawa and gives them a delightful postmodern twist. Review by Calvin McMillin: When a director chooses to film a movie in black and white, he or she is faced with a curious situation. On one hand, since the film cannot rely on the vibrant imagery that color film stock can provide, the filmmaker risks losing the audience's interest, particularly in this Attention Deficit Disorder-plagued world we now live. On the other hand, a black and white film can instantly convey something that one in color cannot. Perhaps it's due to the rarity of black and white movies in our Technicolor society or maybe it's the unconscious correlation of black and white footage with documentaries, but whatever the reason, films shot in black and white give the illusion of verisimilitude. And in the case of Samurai Fiction, one is almost convinced that it's a lost Kurosawa film. Almost. But what director Hiroyuki Nakano does with this jidai-geki (period-set picture) is truly unique. Samurai Fiction is by no a straight-laced homage to films like The Seven Samurai or Yojimbo, but instead contains many contemporary touches. Instead of maintaining a strict adherence to black and white, Nakano uses color to highlight certain scenes (red, in particular, is employed when someone dies). Also, the film eschews traditional Japanese music in favor of a catchy jazz-rock soundtrack that is surprisingly successful at propelling the film along. And though many of Kurosawa's classics are punctuated by a good sense of humor, Samurai Fiction's comedy is more offbeat and almost anachronistic. The samurai code of honor does exist, but this is also a world where people suffer from anime-style nosebleeds and traveling minstrels play "Dixie" on wood saws. Rather than distract, all these peculiar additions make for an interesting contrast with the respectable, almost historical feel that the black and white appearance provides, making for a truly unique viewing experience. However, when it comes to plot Samurai Fiction is simplicity in motion. Heishiro Inukai (Mitsuru Fukikoshi), a short-fused but well-intentioned young warrior, returns home from school to learn that his clan's precious sword has been stolen. The culprit, Kazamatsuri (Tomoyasu Hotei), isn't one to be trifled with. Tall and imposing, he is a consummate warrior interested only in testing his skill as a swordsman. Unperturbed by the notion that dueling with Kazamatsuri would most likely end in his own death, Heishiro sets off alone to recapture the treasured blade. However, much to Heishiro's displeasure, the young samurai's two best friendsKurosawa and Suzukiattempt to accompany him on the journey in a hilarious chase sequence. Eventually the heroic trio catch up with Kazamatsuri, but the more proficient samurai prevails leaving Heishiro and Suzuki wounded and Kurosawa dead. Luckily, an elder samurai, Hanbei Mizoguchi (Morio Kazama), intervenes to protect the surviving two from being slaughtered. Hanbei takes them to his home and nurses them back to health with the help of his cute, fresh-faced young daughter, Koharu (Tomaki Ogawa). As a samurai, Hanbei's philosophy is in direct contrast with Kazamatsuri. Rather than embrace the way of the warrior, Hanbei promotes a life of peace. While Hanbei tries to instill into the headstrong Heishiro these values, the lovely Koharu develops a budding, but chaste romance with the erratic young man. As Heishiro prepares for his eventual confrontation with Kazamatsuri, the evil renegade is employed Yojimbo-style by a female gambler (who looks strangely like Lucille Ball), and befriends her motley crew (including some soccer hooligan lookalikes and a miniscule, full-bearded weirdo). Hilarity ensues in both camps before the film's final conflict. 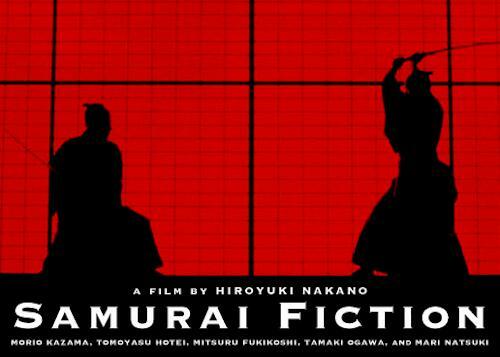 Samurai Fiction is a consistently funny and entertaining film. The character of Heishiro is comically short-tempered, exploding at one point in a Luke Skywalker-esque "We're wasting our time!" after only a millisecond of silence. Though not a straight send-up of chambara classics, Samurai Fiction does contain the odd reference here and there. In many old samurai films, there are scenes in which a master calls upon his faithful ninja, who then drops down from the ceiling to do his lord's bidding. Here we have the ninja Kagemaru (Kei Tani), who is elderly and not quite as sprightly as he once was, getting a laugh each time he appears onscreen. Kazamatsuri, though depicted as a superior fighter and definitely an intimidating presence, is even subjected to a few subtle jabs about his quirky sexual practices. Notes:  Heishiro's pals are named Kurosawa and Suzuki, presumably in reference to Akira Kurosawa and Seijun Suzuki. Or maybe it's just a coincidence.  Hiroyuki Nakano directed the early 1990s Dee-Lite music video "Groove is in the Heart." But don't hold it against him.